A sensory bath is a totally lovely activity to do with kids, and one that kids of all ages enjoy, not just the teeny ones. You really don’t need much for this activity so you won’t need to spend loads of money, which is always a good thing! a pack of glow sticks – available at most supermarkets and pound stores. lavender bath milk – choose a natural one so it’s soothing on the skin. relaxing music – I just use my iPhone and play the music in the bathroom. Have the bathroom in semi-darkness so the kids get the full effect of the glow stick lights in the water. Run a nice warm bath, add the lavender bath milk and give it a swirl around the water. Choose some relaxing music, it could be specifically relaxation music and sounds or just music your child likes to listen to. 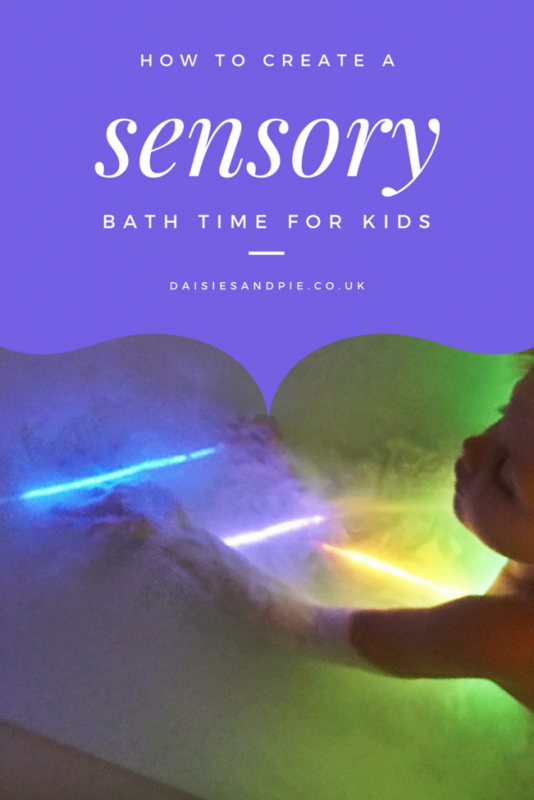 Just let your child enjoy the bath, no stress or guided play, just chilling out and enjoying the time. Warm the bath towels and pyjamas ready for snuggling up in after the bath.